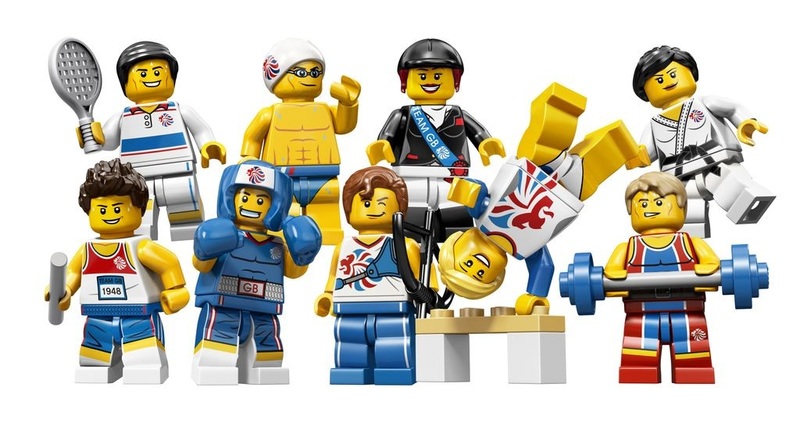 Yesterday, after an agonising week-long wait, I finally managed to get hold of two boxes’ worth of Team GB Collectible Minifigures. They started popping up in John Lewis and WH Smith stores across the UK last week in limited quantities, but they have been released officially today. No doubt you’ll have seen them being sold for extortionate prices on feeBay and BrickLink – they are exclusive to the UK. But anyway, having felt through a whole load of bags yesterday (I wanted to keep a sealed set for the vault), here are some tips for identifying specific figures. Look for the bow, namely the arrow and the holes on either side. This is one of the easier ones to spot. Feel for the headpiece, with a grooved circular part on top. Look for at least one 1×1 brick, or the 1×4 plate. Another fairly easy one. Look for the hairpiece, which has a ponytail at the back. Since this figure has the same hairpiece as the Gymnast, make sure there are no 1×1 bricks or a 1×4 plate. Look for the racquet, with its very distinctive shape. Look for the 1×4 bar, and then for the weights: these have a stud on top and a hole underneath, and are about half the height of a minifigure head. Look for the 1×4 bar, then the rough top of the hairpiece. This is a very easy and common figure to spot. the cap usually gets stuck on the 4×3 tile. Look for a squidgy hairpiece, but to confirm very carefully feel for what feels like a sprue attached to it.